Gillian Brown's book probes the key relationship between domestic ideology and formulations of the self in nineteenth-century America. Arguing that domesticity institutes gender, class, and racial distinctions that govern masculine as well as feminine identity, Brown brilliantly alters, for literary critics, feminists, and cultural historians, the critical perspective from which nineteenth-century American literature and culture have been viewed. In this study of the domestic constitution of individualism, Brown traces how the values of interiority, order, privacy, and enclosure associated with the American home come to define selfhood in general. 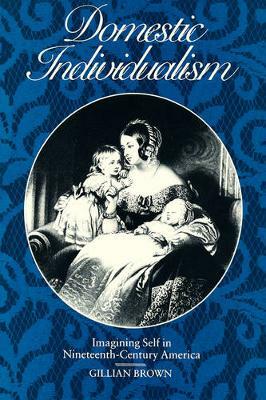 By analyzing writings by Stowe, Hawthorne, Melville, Fern, and Gilman, and by examining other contemporary cultural modes--abolitionism, consumerism, architecture, interior decorating, motherhood, mesmerism, hysteria, and agoraphobia--she reconfigures the parameters of both domesticity and the patterns of self it fashions. Unfolding a representational history of the domestic, Brown's work offers striking new readings of the literary texts as well as of the cultural contexts that they embody.